Molecular Cytology was invited to contribute to the museum night of 7 November at the NEMO science center. The evening’s theme was ‘light on life’, as part of the 2015 international year of light. Lindsay Haarbosch, Laura van Weeren, Joachim Goedhart, Renée van Amerongen and Dorus Gadella demonstrated the principle of fluorescence and the use of fluorescence technology in life sciences research. To this end, they put together an interactive exhibit, where visitors marvelled at a bright array of fluorescent dyes in solution as well as genetically encoded fluorophores, including the novel bright cyan and red coloured fluorescent protein variants developed at Molecular Cytology. For a hands-on experience, visitors viewed fluorescently-labelled subcellular structures as well as complex mammalian tissues under the microscope. 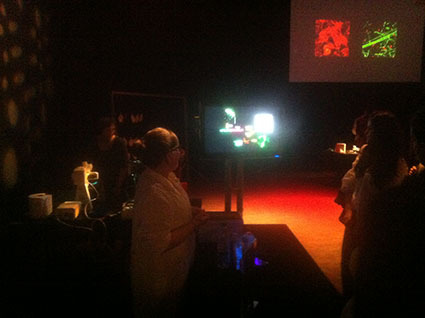 Inspired by Lindsay’s famous bacterial colony paintings on petridishes, the museum visitors could then make their own artwork using fluorescent solutions and transform their smartphones into a blacklight. During the annual Amsterdam Museum Night, over forty museums open their doors between 7:00 p.m. and 2:00 a.m. That night, museums offer special activities including music shows, performances, guided tours, and much more. The Amsterdam Museum Night attracts some 26.000 visitors every year.